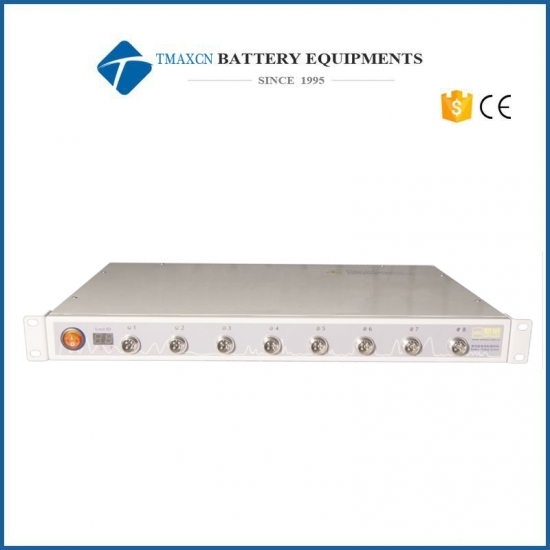 Best Laboratory Precision 8 Channel Battery Tester (40mA - 20A Up To 5V) With Software For Sale,manufacturers,suppliers-Tmax Battery Equipments Limited. TMAX-BTS-5V20A is a eight-channel battery analyzer suitable for most applications in battery testing fields such as electrode materials research, battery performance & cycle test, small-scale battery formation, capacity grading, battery pack testing and etc. 2. Benefits from the implementation of four independent constant-current & voltage sources, each channel can function independently without interfering each other. 0-1 mA, 0-10 mA, 0-300 mA, 0-2 A, 0-3 A, 0-5 A, 0-20 A, 0-30 A, etc. Eight independent programmable channels. Each channel can have different working modes and functions independently. 2. Limited threshold conditions include voltage, current, time, capacity, negative voltage slope, etc. Two years limited warranty with lifetime support for the battery analyzer.